During treatment, or at the time of diagnosis, people may have rushed to support you. What can be difficult is accepting help later on. It takes time to rebuild after cancer; our friends and family might not fully understand this. Perhaps they try to fix you, offering you helpful advice. Yet ‘do more, you’ll feel better,’ doesn’t always work in the fatigue dimension. Neither does ‘get some rest, you’ll be fine tomorrow.’ Sleep doesn’t provide the energy fix you crave. Having good days and bad days is difficult for others to understand too. As humans we generalise. If you shop, you eat out, others presume you always behave like this. They’ll never see the days behind closed doors, when a shower could wipe you out for hours. It's understandable that people equate fatigue with the tiredness they have experienced themselves. Whether that's the weariness of child rearing, or the ache after a long day’s work. But fatigue can never be like that. It can’t be easily fixed. And unlike the satisfaction of parenting, or the financial or intrinsic rewards of work, our tiredness reaps no benefit. It feels worthless. If we’re fair to ourselves, we know this fatigue has worth. It is the frustrating consequence of that ultimate goal: survival. To use the war metaphor, it is one of our battle scars. We should wear it with pride. Yet unlike a war hero, our fatigue is invisible; how can we be proud of something so easily overlooked? So, we resent fatigue and this resentment can spread. But it doesn’t have to be this way. If we promote more understanding in others, we may come to accept fatigue better ourselves. The world will become a kinder place. Whether through the analogy of The Fatigue Dimension, or though the Spoon Analogy we can explain that, regardless of how healthy we may look, our energy is diminished and we need be more careful how we use it. Hearing these stories and analogies builds empathy, not just feelings for you, but understanding for everyone with invisible illnesses, so share them around. 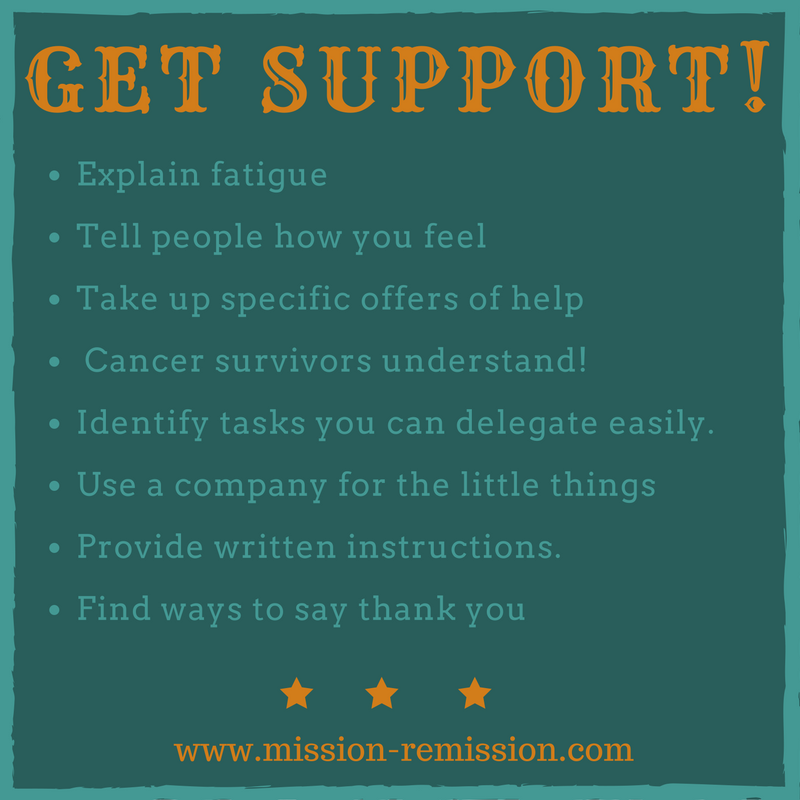 So how can delegation help those with fatigue? Tell people how you feel.Then they’ll know when to offer a hand and when you want independence. But try to find a way to do it without having to mope, as this just drags you down. Perhaps look at the 'How Are You' page. Are there any specific tasks that others have offered to do? You could ask over text if it makes it easier. However, don’t seek help on a forum, or Whatsapp group. Without targeting a specific person, you might not get a positive response. Once, I asked 15 people if one would pop to the shop for me… radio silence. Seek those that have experienced cancer or ill health in the past. They *really* understand. Identify tasks that you can delegate easily. For example: sending teenagers to buy the emergency milk; asking others to drive; or letting someone else do the organising. Use a company for little things: online shopping is a life-changer. Read the Access Page for more ideas. With more complicated tasks, make sure you provide written instructions. Find interesting ways to say thank you, whether with a small gift like a plant, a drink in the pub, a card, or posted letter.